This is the transcript of a series that aired on NWPR the week of June 19, 2008. "Our Organic Northwest" is a series of conversations on-air and online about organic agriculture in the Northwest. Today, we answer more of your questions about organic agriculture. Correspondent Glenn Mosley spoke with Brad Jaeckel, the project manager for the organic farm at Washington State University in Pullman. Organic means that the food that is labeled as organic meets USDA standards. And these are national standards that have to be followed if a producer wants to label their food organic, and that name can only be used if it is such, so to meet those standards a producer has to follow the guidelines and they're going to be different for every type of situation. Fruits and vegetables are going to have different standards then a meat producer, or a dairy producer, or a processor. So each of those different types of outfits have to follow standards. For fruits and vegetables, the main things that we have to watch out for are non-approved applications, in particular herbicides, pesticides and fertilizers. PULLMAN/Maybe it’s because it’s all around us, and we walk all over it, but the fact is we don’t always pay enough attention to our soil, which scientists describe as a fragile resource. In fact, we are running out of soil in certain parts of the country that are experiencing erosion loss. Even the Palouse region of Washington and Idaho is one of the top ten erodable areas in the country. Jaeckel says another concern is the overall health of the soil that remains. He says relying on intense chemical fertilizers does not address the issue of soil loss. Scientists say managing and maintaining soil is an important part of our future. Once soil is gone, it’s gone, they say, and it takes a long time to build it back up. This is the transcript of an interview that aired on NWPR the week of June 4th, 2008. This is Gillian Coldsnow with "Our Organic Northwest" a series of conversations on-air and online about organic farming and organic home gardening. Today: a conversation about the importance of soil and soil amendments to organic gardening. Brad, this is the second in our series and in response to our first discussion a week ago we had a question from a listener who called in and asked about growing vegetables in pots for a small, 2 person family and how best she could do that inside a house, in a green house...interested in lettuce, tomatoes, carrots, things like that. That’s definitely doable on a small scale for folks that don’t have garden space outside and, I actually have a lot of my students that do container gardening and that’s something that you can do even on your porch, which is really handy. Once the out-time temperatures are above freezing you can move plants in those containers outside. Tomatoes are real a common vegetable that’s grown in containers and they just need to be given enough space to grow throughout the season. So up to a 5 gallon bucket would be a good size for the tomato. But you can also grow lettuces, peppers... carrots I haven’t grown in containers, we've had a few people experiment with that this year but... really you could experiment with many different vegetables in containers and doing those indoors, and outdoors. We also had another listener with a question concerned about the sustainability of organic agriculture. What do you say to that? Is whatever your doing sustainable for the environment? And is it sustainable socially? So when we try to address the sustainability in organic Ag, those are really the three big areas that we're trying to look at, and largely organic Ag has been addressing environmental sustainability concerns. But also, were concerned about farmers receiving fair wages for there work, and farmers do receive a premium for organic fruits and vegetables so, that’s good. But also we need to be concerned about wages that laborers are receiving. And is that food staying in the community or is it being transported long distances? Its really a complex issue, and I think its something you have to take case by case, but really try to address those three key topics when your looking at a certain issue is going to be important. I think largely organic Ag is working toward being sustainable, but it is a big issue. For more information on organic gardening, go to N-W-P-R dot org and click on "Our Northwest". Ask questions about gardening or any agriculture issue that interests you and we'll connect you with an expert. There are also links to resources such as the Master Gardening Program, a comprehensive resource founded here at WSU. "Is organic agriculture sustainable for the commercial farmer?" Is whatever you're doing sustainable for the environment? So when we try to address the sustainability in organic Ag, those are really the three big areas that we're trying to look at, and largely organic Ag has been addressing environmental sustainability concerns. But also, we're concerned about farmers receiving fair wages for their work, and farmers do receive a premium for organic fruits and vegetables so, that’s good. But also we need to be concerned about wages that laborers are receiving. And is that food staying in the community or is it being transported long distances? Its really a complex issue, and I think its something you have to take case by case, but really try to address those three key topics when you're looking at a certain issue is going to be important. Is it possible to replace current farm practices with organic farm practices and make operations financially feasible? Organic Gardening - A Moneysaver? As increasing fuel prices continue to drive up the cost of groceries, some experts are suggesting that home gardening would help many people save on food costs. Others aren’t so sure. Glenn Mosley reports. The line of thought from many experts goes something like this—prices are going higher in the grocery store, and so to save money the thing to do is grow your own food, in your yard. You’ll save money that way. Not so fast, say others. Gardening also takes time, resources, and money and may not, in the end, provide an economic alternative to those prices in the supermarket. A fairly significant garden space is needed, they say, to really have an economic impact. <> It’s s topic that has people on both sides talking. Our Organic Northwest Part 1: What's Organic? This is a transcript of the interview that aired on NWPR the week of May 25th, 2008. Correspondent Glenn Mosely spoke with Project Manager of WSU's Organic Farm, Brad Jaeckel (JAY-k'l), who also teaches for the WSU organic agriculture major program, the first such major in the country. Glenn asked Brad to define organic gardening. We are not allowed to use nonapproved substances and those are primarily herbicides and pesticides. But there actually are some organically-approved substances that can be used in certain situations. That's largely changing as the technology allows and new products are available on the market. I like to think of organic in positive terms. you hear a lot of negative definitions of organic; what you can't use what you can't do. But really to me organic is about all the good things that you do in an organic system. probably the most imporatnt thing we do is work to build healthy soil. without healthy soil we can't grow healthy plants and [in] turn healthy food to eat. By definition soil is really a mix of natural ingrediants made up primarily of any organic materials that are largely decomposed. There's also mineral contents in the soil. There will be a combination of clay, sand, silt to make up whatever soil you have. Here on the Palouse we have clays. Different parts of the state have different soils made up of different mixes of those three components. Brad, what are the important things we need to remember to help us build healthy soil? We really try to encourage building of soil - is what we call it - and part of the building is adding organic matter on a yearly basis. There are a few different ways you can go about doing that. Compost is going to provide your soil fertilizers...and also a really healthy microbial environment. You can also do things like growing cover crops. These are going to be crops like grasses, legumes, different peas. They're crops you grow not necessarily to harvest, but to add back to the soil. So you grow them to a certain stage and then you work them back into the ground and they decompose. And they really add the basis of that organic organic material. So, generally speaking, you want to maintain nutrients in the soil? Yep, you want to maintain a healthy nutrient level in your soil. And there's key nutrients that you are primarily interested in. It's going to partly depend on what crops you are growing; you are going to add different green manures to add different nutrients. And the organic mater is really important because it does a lot of good things to your soil. It helps to increase the capacity of the soil to retain moisture, which is going to be a growing concern in a lot of areas. And it also helps that microbial environment to really thrive. 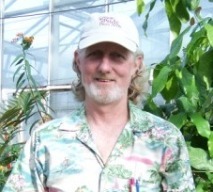 Brad Jaeckel is project manager of the organic farm at Washington State University in Pullman. I’m Glenn Mosley. For much more information on organic gardening, go to N-W-P-R dot org and click on "Our Northwest". You can ask Brad questions about gardening at your home. There are also links to important resources such as "Local Harvest", which helps you find organic produce in your community. That's "Our Northwest" at N-W-P-R dot org.